by David Schiff. Outdoor projects are perfect for the do-it-yourselfer, and the projects in this book are designed and presented specifically for those of us who spend 9 to 5 doing something other than carpentry or woodworking. I This Stanley-branded book is designed to help you think about your outdoor space as a whole and then create the garden structures and furnishings that fit the way your family lives. Here you will find: •14 great projects covering everything from simple outdoor furniture to a small garden shed and a colorful chicken coop •each project is designed to fulfill a need •easy to build without special skills •customizable to fit your space and your style. If you can read a tape measure, drive a screw and a nail, and cut a straight line, you can handle any project in this book. Even if you are new to working with wood, you'll find handsome and useful projects in these pages that are perfect for getting your feet wet. Materials, Techniques and Projects for Building Your First Door. Few pieces of furniture, save perhaps chairs, work as hard as doors. Building them to last, especially exterior doors, takes knowledge and experience that don’t come from making other types of furniture, such as tables and bookcases. Doormaking: Materials, Techniques and Projects for Building Your First Door by woodworker Strother Purdy gathers all the information and guidance that both beginning and intermediate woodworkers need to be successful making their first door. From the editors of Fine Homebuilding. All-new edition keeps you up-to-date! In the ever-evolving world of remodeling, it’s important to keep on top of current issues - and that's easy with the newest edition of Kitchen Remodeling, from the editors of Fine Homebuilding. It focuses on the latest ideas and what it takes to renovate a kitchen of any size or shape, on any budget. For Pros by Pros - the resource for builders and serious amateurs. 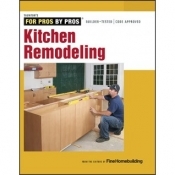 Like every book in the For Pros by Pros series, the information in Kitchen Remodeling is geared to professionals. Culled from the best articles in Fine Homebuilding magazine, it’s the go-to resource for builders, remodelers, and the building trades. Everything to remodel a kitchen from top bottom. Kitchen Remodeling brings a lot to the table in helping to plan and complete a remodel without costly missteps. It’s where pros turn for sound advice on every aspect of a makeover, from opening up a small kitchen to getting appliances to fit, to building an island, a corner nook, or the perfect pantry. An in-depth look at those all-important cabinets. Every aspect of a remodel is critical whether you’re talking countertops, flooring, or ventilation, but kitchen cabinets consume the lion’s share of attention. A good portion of Kitchen Remodeling addresses this concern with must-know information that covers: •Quick cabinet upgrades •A buyer’s guide to kitchen cabinets •Installing stock cabinets •Installing cabinets in tight spaces •A faster, easier approach to custom cabinets •How to install inset cabinet doors Answers to the hard questions too! Kitchen Remodeling doesn’t dodge the most-asked questions, such as: What will the remodel cost? How to stay within budget? Is there room for more storage? Are there options? Get your copy now and get the answers you need.